Windows RT is still hanging in there, even though the number of ARM-based devices available with it doesn't exactly seen to be growing. Note that the latest Windows 8.1 Update 1 also caters for the ARM-based Windows RT. But despite that, as well as high initial prices for products like the Surface RT plus notable stillborn devices and absentee vendors, Microsoft still appears to be committed to the cut-down version of Windows 8 and now Windows 8.1, even if RT barely got a mention in the keynote that opened Microsoft Build yesterday. We got our hands on RT 8.1 which we found running on a Surface at the Build event. Here's some shots direct from the device. The first thing to say is that there is no going back if you install the Windows 8.1 RT Preview over standard Windows RT. You can't roll it back - you'll only be able to upgrade to the final version via Windows Update when it's released. 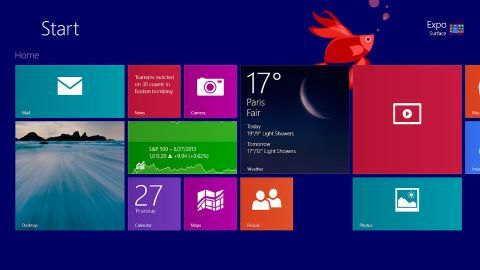 As we stated in our main Hands on: Windows 8.1 review, the enhancements to Windows 8.1 make it a far more usable operating system - the new side-by-side app views make things much easier. And then, of course, there's the fact the desktop now has a Start button back, even if it does nothing but launch the Start screen. You can also swipe up on the Start screen to view the All apps display, which is a great enhancement and far more like the old-style Start menu. The integration between the Start screen and Desktop is now a better blend - a description used by Steve Ballmer during the Windows 8.1 launch. It may sound like bluster, but it's true. Gone is the jarring nature of the two interfaces for the most part, although new users will still find it a steep learning curve. Windows RT doesn't change its stance on Desktop apps. Aside from the main Microsoft Office apps, no others are allowed or enabled and you'll get an abrupt error if you try to run one. We're not sure why Microsoft doesn't go the whole hog with RT and bin the Desktop. Unless you're moving files around or using an Office app, it's useless. The big thing in Windows 8.1 RT is that there is now a version of Outlook. That is big news and a real bonus since it really turns RT devices into something that can be used for work - nobody in their right mind would try and handle work email inside the standard Mail app - it's just not up to the task. As with the other key Office apps, this will come with all RT devices. As you can see, Outlook on the Surface looks pretty empty. It seems exactly the same as the Office 2013 version. But RT does have its problems. The chief issue is that it is still very slow. We were using an Nvidia Tegra 3-based Surface RT, but compared to equivalent Tegra 3 Android devices the OS still feels very laboured. Starting one of the Office apps involves a delay of a few seconds before you even see the splash screen - making you think you haven't tapped on it properly. And there were some other issues, too: the system completely hung and wouldn't accept any gestures twice during our play around. We know this is pre-release software, but we're typing this on an Ultrabook running the full Windows 8.1 Preview and we have had no issues with it since installing it 24 hours ago. Hopefully these bugs will be ironed out, and with rumours of Surface 2 running Qualcomm's Snapdragon 800, the speed may not be a problem in future. Windows RT 8.1 is far more usable though - that's the bottom line. We're not convinced about the change in search which makes searches inside apps less of a priority in favour of web searches, but the enhancements to things like the Settings app (now more like the Control Panel) are excellent. SkyDrive is now totally baked into the OS - it may seem like Microsoft is giving it the hard sell, but the simple fact is that cloud storage can compensate where small capacity flash drives on tablets cannot. We like Windows 8.1 and we like the enhancements it brings to Windows RT - especially Outlook, which is a dealbreaker for many who have shunned Windows RT devices. But there are problems with speed and reliability while there remain fundamental questions, such as whether there should be a Desktop in Windows RT. As an update, we'd definitely recommend it if you have a Windows RT tablet, But, since you can't roll it back, we'd wait for the full release rather than installing this preview.